*** Who Will Protect the Next Olympics From North Korea? In less than six months, the XXIII Olympic Winter Games will begin in Pyeongchang, South Korea. But with an increasingly militant North Korea located less than 161 kilometers (100 miles) away, legitimate concerns have arisen over the event's potential disruption. Thomas Bach, the president of the International Olympic Committee (IOC), recently said he was closely monitoring the situation, adding that it would be a topic of discussion at the committee's upcoming meeting in Peru. Even so, it's hard not to wonder who will bear the responsibility of ensuring the safety of athletes and spectators in Pyeongchang. The answer has been constantly evolving for over four decades. A defining moment for the question of the sporting event's security came in 1972. During the Munich Olympics, the Palestinian terrorist group Black September took 11 Israeli coaches and athletes hostage; all of them died during a botched rescue attempt by German authorities. At the time, the committee's leaders classified the incident as an "internal problem" for the German government. The IOC, they insisted, should not get involved. Even in the aftermath of the massacre, the committee paid little attention to security because of its long-standing conviction that politics and sports don't mix. When it became apparent that the world of international sports needed to take some sort of action, the IOC made sure to place the task in someone else's hands: those of the independently run local organizing committees established for each Olympic Games. KARACHI, Pakistan — It was happening again, but worse than ever: Hundreds of thousands of ethnic Rohingya Muslims were fleeing Myanmar while under attack by the security forces, and the deaths kept mounting. Everybody in the vast Arkanabad slum of Karachi has family members who were affected by the government raids that started last month. 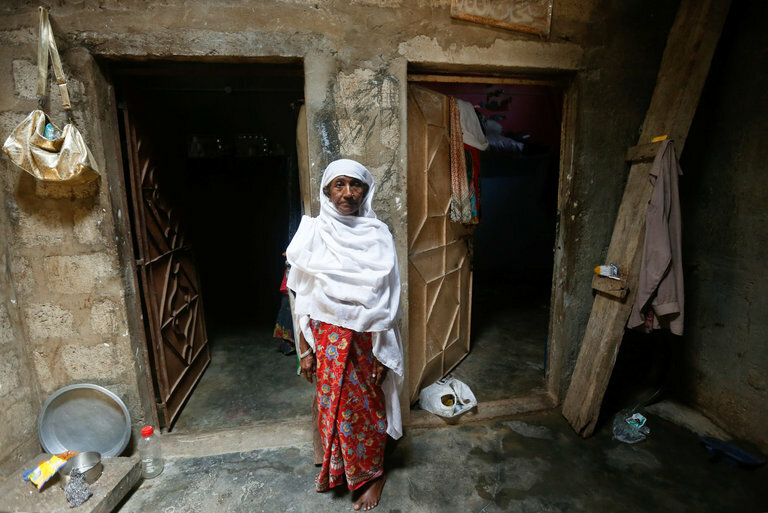 Outside Myanmar, and perhaps now Bangladesh, Pakistan is home to the highest concentration of Rohingya in the world, from a previous exodus of Rohingya in the 1970s and ’80s. A vast majority live in neighborhoods that are distressingly impoverished even by Karachi’s standards. Now they are angry that Pakistan is not doing more to stop the killing in Myanmar, let alone improve the condition of the estimated 500,000 Rohingya who live in this country. The International Strategic and Security Studies Programme (ISSSP) at the National Institute of Advanced Studies (NIAS), in collaboration with the Department of International Studies and History, Christ University, organised a workshop titled “Nuclear India: Revisiting issues, challenges and threats” on 24 August 2017. The introductory notes by Air Marshal Vinod Patney and Professor Rajaram Nagappa focused on the importance of understanding the issues and challenges faced by a nuclear India. The first session was led by Air Marshal (Retd) Vinod Patney, currently the Director of Centre for Air Power Studies (CAPS), New Delhi. This session focused upon the topic “Why did India go nuclear and What is India’s Nuclear Doctrine”. He successfully traced down the history from 1945 till 1998. The dynamics within the political structure and the threats from India’s neighbors were discussed upon. He gave brief explanations on the peaceful nuclear explosion by India in 1974 and 1998. Furthermore, India’s Nuclear Doctrine and its two major principles, Credible Minimum Deterrence and No First Use Policy, were elaborated upon. There is no point in denying that the Indian bureaucracy is one of the worst in the world and is widely notorious for its labyrinthine rules and genetic negativity. India is also among the most corrupt nations; surely a large part of the bureaucracy must have either connived in it or abdicated its tasks. On the Corruption Perceptions Index, India's rank is 79th, which is rather shameful, while, where 'the ease of doing business' is concerned, we have moved just a couple of notches but are still below 129 other nations. What amazes us, however, is that even so, several lakhs of young and not-so-young aspirants spend months and years to prepare and appear for the prestigious civil services examinations. They include a large number from the Indian Institutes of Technology, National Institutes of Technology, Indian Institutes of Management, medical colleges and rank-holders of Indian and foreign universities - for a job where they would earn a pittance. It is certainly not true that they enter the services to be a party to corruption, except for a very small section, and to most 'public service' is better than enriching a merchant. It confers greater responsibility and social prestige. In spite of such 'good boys' heading administration, India's ranking is 168th in the world where literacy rate in concerned; 131st in the Human Development Index while in the Global Hunger Index we are below 96 nations. The iPhone 8, expected to be launched on September 12, is already an online media sensation. And with good reason. The release of each new iPhone is a technological shock that has the capacity to reconfigure a large chunk of the global economy. Other new products offer incremental improvements that over time can have a cumulative effect on economic structure. But a new iPhone isn’t so much a new device as a new ecosystem. Each new iPhone opens up technological niches that are then exploited by thousands of other companies, from giants such as Facebook to small developers of all kinds of gadgets and apps. Its repeat record of industrial renewal has made Apple the most profitable company in the world. It has also created a new economic system that spans the Pacific region, from California in the east to Sichuan in the west and everywhere in between. This system might be called the i-economy, since it depends so heavily on the iPhone and the technological ecosystem it supports. The Pacific i-economy is centered on smartphones, but its reach is much broader. It takes in a host of related industries that depend on the smartphone ecosystem for their very survival. The i-economy includes apps, but it also directly sustains Hollywood, popular music, electronic gaming, electronic publishing, Internet search, ride-hailing services, food delivery services, photography, and financial technologies. All of these industries are or are in the process of becoming mobile based. The good news is that no one in a position of responsibility in either the U.S. or Chinese government wants a military conflict. Everyone knows that war between the world’s two largest economies would be catastrophic. This leads many observers to conclude that war between the U.S. and China is inconceivable. But when we say that something is inconceivable, we should remind ourselves that this is a claim about what we can conceive—not about what is possible in the world. To stretch our imaginations, we need look no further than history. While history never repeats itself, as Mark Twain observed, it does sometimes rhyme. So we should ask: What past events resemble the current predicament posed by North Korea’s nuclear advance, and how can they provide perspective on what we are now seeing—or even clues to what may happen? Up until the “disengagement agreement” of August 28 which led to withdrawal of Indian troops and an end to Chinese road construction in the disputed Doklam (Donglang in Chinese) plateau at the China-Bhutan-India tri-junction, China’s official media and spokespersons had unleashed a daily barrage of vitriol and warnings of an imminent “short and swift war” to teach India a “bitter lesson” and inflict “greater losses” than the Sino-Indian War of 1962. 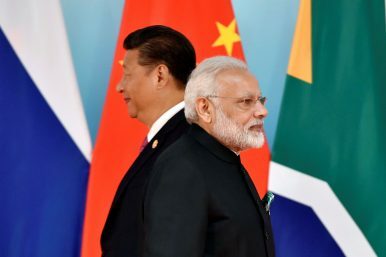 Contending that Doklam was “Chinese territory,” Beijing’s media, along with its foreign affairs and defense spokespersons, demanded India’s unconditional withdrawal. New Delhi was adamant that road building was in violation of several bilateral agreements (agreements in 1988, 1998, and 2012 specifically) with Bhutan and India. To independent observers, Beijing’s behavior in the Himalayas seemed consistent with its incremental expansion of strategic frontiers by drawing new lines around China’s periphery in the land, air, water, sand, and snow. Troop mobilization along their disputed frontiers saw tempers running high, and for the first time since the 1987 Sumdorong Chu valley face-off, violent clashes occurred in the Ladakh sector. The confrontation was the worst in decades between Asia’s old rivals. 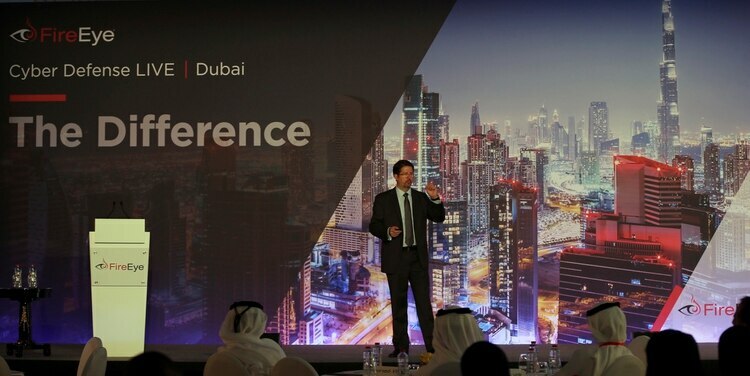 Tony Cole, Vice President of FireEye Inc., a cybersecurity firm headquartered in Milpitas, California, speaks at the FireEye Cyber Defence Live conference, Tuesday, Sept. 12, 2017, in Dubai, United Arab Emirates. State-sponsored hacks have become an increasing worry among countries across the Persian Gulf. They include suspected Iranian cyberattacks on Saudi Arabia to leaked emails causing consternation among nominally allied Arab nations. From suspected Iranian cyberattacks on Saudi Arabia to leaked emails causing consternation among nominally allied Arab nations, state-sponsored hacks have become an increasing worry among countries across the Persian Gulf. Defending against such attacks has become a major industry in Dubai, as the city-state home to the world’s tallest building and the long-haul airline Emirates increasingly bills itself as an interconnected “smart city” where robots now deliver wedding certificates. They fear a massive attack on the scale of what Saudi Arabia suffered through in 2012 with Shamoon, a computer virus that destroyed systems of the kingdom’s state-run oil company. If the United States wishes to defeat bin Laden's heirs and the toxic potency of their message, it needs to recommit to its most basic values. Late last month, Iran’s Islamic Revolutionary Guard Corps (IRGC) publicized its drone strikes against the Islamic State near the Iraqi border in Syria. The IRGC deployed the drones as part of its revenge campaign against the Sunni jihadists, and also to show off Iran’s growing fleet of Unmanned Aerial Vehicles (UAVs). In early August, the Islamic State raided an IRGC position near Jamouna, about 37 miles northeast of the US base in Tanf, Syria. The self-declared caliphate’s offensive led to the deaths of dozens of Iraqi militiamen fighting for the Seyyed al Shuhada Brigades. Several Iranian operatives embedded in the militia were killed as well. Abu Bakr al Baghdadi’s loyalists captured and beheaded an Iranian officer. Photos of the dead Iranian, portrayed as a “martyr” by IRGC-affiliated sites, subsequently went viral. So the IRGC and allied Shiite jihadists vowed to exact retribution. In firing yet another ballistic missile directly over Japan, the second in as many months, Kim Jong-un is trying to normalize the idea of North Korea’s strategic capability. Normally, it would seem that this latest provocation will result in an even firmer coalition of South Korea, Japan and the United States opposed to his nuclear and missile programs; even more, Kim’s brazen recklessness and increasing threat to regional stability may force China into a more serious attempt to curb him. Yet it is just as likely that Kim’s repeated flouting of international condemnation at little actual cost is serving to prove the idea of North Korea’s essential immunity from outside pressure. In reality, both of these outcomes are happening at the same time. There is no longer any doubt that Kim is far more brazen than either his father or grandfather before him. What we will never know, however, is whether Kim Il-sung or Kim Jong-il would have acted the same as their descendant had they possessed the same technical capabilities. This is an important question to ask, since much official analysis of Kim’s character and motives is based on the growing conviction that he is somehow less stable, more erratic, less restrainable and more dangerous than his forbears. BRIEFS COLUMNS THE DEAD DROP OUR EXPERTS ABOUT US FEEDBACK SPONSORSHIP PODCASTS THREAT CONFERENCE Twitter Linkedin Facebook Instagram Russia’s Looming Military Exercise: A 21st Century Trojan Horse? 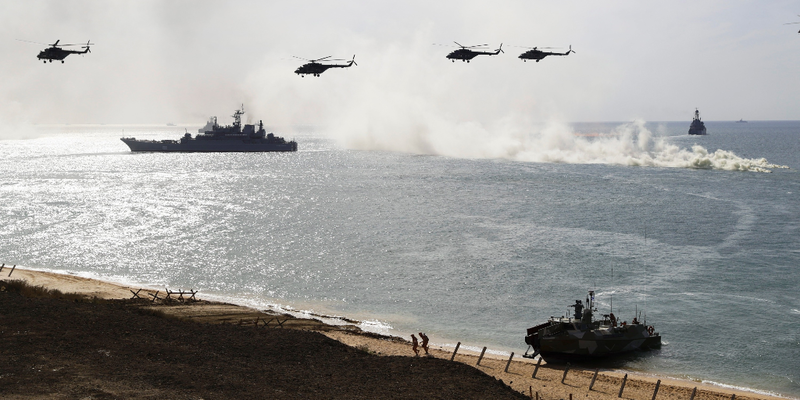 Beginning Thursday, as many as 100,000 Russian and Belarusian troops will launch major military exercises along the border of three NATO countries. Russia’s upcoming Zapad military exercise, which will simulate a response to an attempted overthrow of the Belarusian government by an insurgency unfriendly to Russia, has European countries and the United States on edge at a time when relations between the NATO alliance and Moscow are colder than ever. Zapad has the potential to be the country’s largest military exercise since the Cold War – despite Russian claims that only roughly 13,000 troops will participate, Western defense officials have put forward estimates closer to 100,000. Many suspect the Russians may hold multiple, smaller, simultaneous exercises as unofficial parts of Zapad, to adhere to the letter, if not the spirit, of the official 13,000 limit. Why 13,000? According to the Vienna document, an agreement among the nations of the Organization for Security and Co-operation in Europe of which Russia is a member, any exercise involving more than 13,000 people – including both military and support personnel – requires that outside observers be allowed to attend. NATO Secretary General Jens Stoltenberg said last week that Moscow’s offer to allow three international observers access is not sufficient. North Korea appears to be stepping up efforts to secure bitcoin and other cryptocurrencies, which could be used to avoid trade restrictions including new sanctions approved by the United Nations Security Council. Hackers from Kim Jong Un’s regime are increasing their attacks on cryptocurrency exchanges in South Korea and related sites, according to a new report from security researcher FireEye Inc. They also breached an English-language bitcoin news website and collected bitcoin ransom payments from global victims of the malware WannaCry, according to the researcher. Kim’s apparent interest in cryptocurrencies comes amid rising prices and popularity. The same factors that have driven their success – lack of state control and secretiveness – would make them useful fund raising and money laundering tools for a man threatening to use nuclear weapons against the U.S. With tightening sanctions and usage of cryptocurrencies broadening, security experts say North Korea’s embrace of digital cash will only increase. As the spotlight shines on the Asia-Pacific theater, Japan is putting aside one of its longest running disputes to revisit its relationship with Russia. For the last 70 years, the Kuril Islands have been a cornerstone of talks between Tokyo and Moscow, and a stumbling block to reconciliation. Russia's humiliating defeat in its 1904-05 war with Japan cost Moscow half the resource-rich Sakhalin Island, as well as the still-disputed Southern Kuril Islands. The territorial loss corked the Russian Navy in the Sea of Japan, limiting the fleet's access to the greater Pacific Ocean. After World War II, the Soviets took back not only Sakhalin, but also the Northern Kuril Islands. After more than a century of rivalry, the two nations have been repeatedly frustrated in their attempts to reconcile. Even now, the territorial dispute has prevented Tokyo and Moscow from declaring a formal end to their WWII conflict. Should the World Fear Russia's Robots? The Russian military has deployed a special mine clearing until to Syria equipped with the Uran-6 unmanned ground vehicle (UGV). While the use of unmanned systems for clearing mines is nothing new for Western forces, it is an illustration of how the Russian military is rapidly catching up as it starts to adopt robotic systems across the board. “The Russian military is firmly integrating unmanned ground vehicles in their operations,” Samuel Bendett, a researcher at the Center for Naval Analyses told The National Interest. The Uran-6 is the first operational UGV that Moscow has adopted for its own forces, but the Kremlin will increasingly rely on unmanned systems as time goes on. “The Uran-6 is the first such UGV to be used by the Russians. There are other models they are working on that will assist Russian soldiers in dangerous demining missions,” Bendett said. Trump firmly believes (it is difficult to complete a sentence that starts with these words) in the value of bluffing. He embarrassed himself after bluffing that he may have tapes about his meeting with then FBI Director James Comey and when he floated firing Special Counsel Robert Mueller. Neither yielded an inch. The president claimed to be “100 percent willing” to testify under oath with respect to his interactions with Comey and the allegations of obstruction of justice that followed. Nobody believed these words. Indeed, we are still waiting. As the North Korea nuclear threat is whizzing toward a point of decision, Trump needs China to take the extra step of cutting off oil supplies to Pyongyang, which could change the dynamics of this perilous situation. To spur Beijing, Trump’s most recent gambit is to announce via tweet that the United States might cut off trade with all nations that do business with North Korea, a threat widely understood as aimed at China, North Korea’s only major trading partner. However, given the size of U.S.-China trade (some $650 billion in 2016, with China as Washington’s third largest export market) and the many millions of American jobs potentially affected, it is all too obvious that Trump is not only bluffing, but is doing so incompetently. The 1938 hurricane season resulted in 700 fatalities. 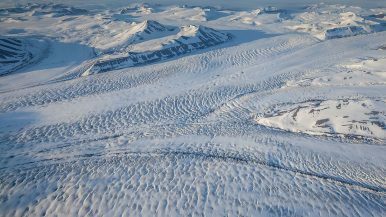 The lack of technology to provide early warning caused that high number. In the current cases of Texas and Florida, casualties are far less because we have early, accurate warning and have learned how to prepare. But since we cannot change nature, we cannot prevent the physical damage and so Congress appropriates vast sums—likely to exceed $150 billion—to repair. Like hurricanes, we know with certainty that major wars recur. Yet while we are increasing funds for recovery from natural disasters, we are cutting our military budget to respond to man-made catastrophes. Human nature has no arc bending toward perfection. In the 3,000 years of recorded history, the most savage and devastating war occurred only 70 years ago. Like hurricanes, we cannot predict when or where the next war will strike. (Unlike hurricanes, some wars are averted because a potential adversary calculates we are too strong to be attacked. It is, however, impossible to prove that negative.) So, like prudent homeowners, we as a people take out insurance in the form of the Defense budget. However, the nature of our democracy is to reduce our insurance payments when not engaged in large-scale conflict, and to surge spending only after the war has occurred. Thus, we allocated to the Defense budget 22 percent of our GDP in World War I, 41 percent in World War II, 15 percent in the Korean War and ten percent in the Vietnam War. It then declined from 6.7 percent in 1972 to 5.5 percent in 1975. At that point, Secretary of Defense James R. Schlesinger publicly decried the trend in cuts as “deep, savage and arbitrary.” He was fired. In 1981, President Reagan proposed raising Defense from 5.1 to 5.7 percent and a majority in Congress agreed. What’s the point of all those numbers? When there is not a major war being fought, only the president has the stature and the “bully pulpit” to influence the Defense budget in Congress. Brewing controversies over “killer drones” are not deterring companies from designing and offering new types of unmanned weapons for which they see a demand in the market. The United States’ best-known unmanned weapons are remotely piloted aircraft like the Predator. The military has deployed hundreds of these systems in the U.S. war against jihadists. And the Pentagon intends to continue to invest in even more advanced unmanned aircraft for strike and surveillance missions. Drone manufacturers also see a wave of innovation in small, soldier-operated armed drones that would serve as aerial spies and snipers for ground forces. “It is heartbreaking to see how many soldiers are killed in war zones like Afghanistan because they can’t get fire support quickly enough to fight back,” says Raziel “Razi” Atuar, the CEO of startup Duke Robotics. Atuar, a veteran of the Israeli military, helped design a gun-carrying drone that he nicknamed “the future soldier.” He argues that remotely operated small drones could help reduce casualties in future conflicts. The Defense Advanced Research Projects Agency — DARPA, the Pentagon’s fringe-science organization — has begun work on a small drone that extend the range of an AIM-120 air-to-air missile. The “Flying Missile Rail” could help U.S. Air Force and Navy fighters match and even exceed the ever-increasing range of Russian- and Chinese-made missiles. The latest AIM-120 boasts a range of around 100 miles. 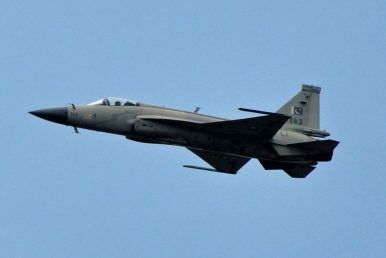 China has been testing a very-long-range air-combat missile that apparently can fly as far as 200 miles. Perhaps just as importantly, program manager Jimmy Jones — and Air Force colonel — wants the robotic launcher to be cheap and easy to produce so that the military could quickly churn out hundreds of them just in time for some big shooting war. DARPA released its request for proposals for the Flying Missile Rail in early September 2017. The agency is proposing to spend $375,000 over the next year or so developing and testing a prototype. The Flying Missile Rail initiative is a response to the increasing cost and complexity of new warplanes. If the military can’t build a new manned fighter quickly and cheaply, maybe it can outfit existing fighters with robotic rails in order to make the fighters deadlier in combat. The political initiative to undertake the reforms, including the initial set of measures that have been announced, is a welcome move. Both enhanced combat capability and efficiency, intended to be achieved through the ongoing reforms, are worthy objectives. This policy brief will attempt to suggest critical policy imperatives that must continue to act as guidelines for the ongoing attempt at defence reforms through the process that has been described as a major change, if it is indeed envisaged as the first such exercise after independence. Military change is defined in a number of ways. In view of the conventional (state-on-state) and sub-conventional (counterinsurgency and terrorism) challenges faced by India, it may be best defined as “an attempt at developing a significantly more effective approach to existing or future military challenges.”2 India’s past experiences suggest that changes often witnessed in the conventional domain have been strategic, aimed at creating major shifts in the military’s approach to war fighting. These have also manifested in the organisational domain in the form of large-scale structural realignments. An example of change in the approach to war fighting was the attempt at compellence during the mid-eighties after having followed a doctrine of offensive defence in the seventies.3 More recently, the strategy of ‘Cold Start’ or ‘Limited Pre-Emptive Offensive’ also qualifies as such a change. Change in the organizational domain is best illustrated by the structural changes that took place immediately after the failure in the 1962 India-China war. Some of the major steps initiated in this regard included an increase in the size of the army from 5,50,000 to 8,25,000 as well as the raising of six mountain divisions and a new command headquarter.4 The changes based on the 1975 Krishna Rao Committee report, which led to the mechanisation of the army along with strategic reorientation, is another example that comes to mind. In the sub-conventional domain, the raising of Rashtriya Rifles (RR) is an important and relatively recent example of organisational change. The TLV in LDN festival, a four-day event celebrating Israeli culture in London, was a great success. The events there were designed to remind Britons of the real Israel: the vibrant and creative Israel that we experience every day, not the one conveyed through the media lens and through the biased news headlines. Israel's public diplomacy efforts, some 100 years after the Balfour Declaration, are as just as challenging today as the diplomatic efforts undertaken by the Zionist Movement at its early stages. In fact, it may be an even more daunting task because the battlefield has changed. Today this battle involves a bizarre combination of anti-Semites, jihadis and, mainly, ignoramuses. Ignorance has become one of the Israel-bashers' most effective tools in their bid to brainwash millions of ordinary citizens, lacking any basic knowledge of the facts about Israel or the Middle East. When the public has no knowledge or impression of something, it becomes easy to lie to them. It becomes easy to showcase the Zionist enterprise as a colonial endeavor detached from the Holy Land. It becomes easy to market Israel as the root of all evil.